"I jumped in to save myself. I've had it with life." The deft touch of Jean Renoir meshes with the clownish talents of Michel Simon in this charming and brazen film, something of a scandal in its time, significantly less revolutionary in ours. Renoir never backed off of the big questions, and his most lauded films (for instance, Grand Illusion) wrestle with the most profound moral dilemmas. Given that Boudu is a comedy, overintellectualizing it may rob it of its humor, and lose sight of its success as an entertainment. And so while I wouldn't want to claim too much for the film�there's no buzz kill quite like doctrinaire social critique�there's plenty here to admire, and that's both entertaining and thought provoking. Simon plays the title character, a tramp sleeping in the Bois de Boulogne, foraging for food and handouts from the bourgeois passersby; he's a mangy fellow with a mangy dog, and his canine companion wandering off is the last straw for Boudu: life no longer seems worth living, so he tries to drown himself in the Seine. Spying him through a telescope and saving him from his watery end is M. Lestingois, a book seller whose home and shop are just steps away from the river; Lestingois rushes out of his apartment and into the water, dragging Boudu to safety, and making the homeless would-be suicide his prot�g� of sorts. Boudu is essentially a force of entropy in the Lestingois home. Not that all was milk and honey to begin with; Lestingois has been carrying on an affair with Anne-Marie, the maid, sneaking into her room for assignations on most evenings; and Mme. Lestingois seems willfully ignorant. (When we meet her, she has just returned from the funeral of a "friend"�the not-so-subtle implication is that she was no more faithful to her husband than he to her.) And so Boudu becomes the family project, a smelly, hairy, tyrannical Galatea, upending all that's been so carefully cultivated in this middle-class home: he gobbles sardines with his fingers, for instance, and gruffly polishes his shoes with Mme. Lestingois' negligee. The film was made in 1932, and in many ways it's a vaudeville; it was based on a stage play, for one thing, and the acting style can sometimes seem a bit too broad, more commedia than Method, not what we're used to. These are stock characters, as well, more types than individuals. And yet Renoir is incredibly generous toward the people in his films, and his love of Simon especially is evident. He's got more than a bit of Harpo Marx in him; a wonderful physical comedian with mad whiskers obscuring his mouth, this Boudu is a hurricane. Charles Granval charmingly blusters his way through as Lestingois; Marcelle Hainia as his wife and S�veine Lerczinska as their maid are both at times charming and shrill, thoroughly appropriate to their characters and the piece. It's a movie essentially about the absurdity of bourgeois respectability�this was racy stuff for its day, but now seems more sweet and smart than riotously funny, more interested in puncturing pretensions than in going for belly laughs. In some respects, Renoir is the rightful heir to this tradition in French comedy that goes back at least to Moliere. But a few words deserve to be said regarding the technical values of Renoir's filmmaking, too�decades before Steadicam, he uses moving cameras to great effect, and his use of zoom lenses is especially well done. The exteriors were shot on location, and seeing 1930s Paris is quite spectacular, like Cartier-Bresson photographs of the period sprung to life. Image Transfer Review: Criterion has done well with what they were given, but unfortunately it looks as if the print of the film is in pretty sorry condition; it's full of scratches, discolorations and erosion. C'est la guerre. Audio Transfer Review: As with the image quality, the transfer is a fine one, but there's no escaping the many imperfections on the mono track. Extras Review: There's a decided emphasis on the sociological import of the film in the package of extras. First, Renoir provides an introduction (02m:56s), shot decades after the film was made, in which he calls the movie "an homage to Michel Simon." The director and his leading man reminisce about the project in a 1967 clip (06m:06s) from French television�seen as scandalous upon its initial release, the film was shut down by the police after three days in a Parisian theater. Godard collaborator Jean-Pierre Gorin, in a 2005 interview (12m:13s), professes his love for Boudu and Renoir. In an installment (30m:42s) of the French television show Aller au cinema, director Eric Rohmer and critic Jean Douchet sit side by side in a screening room, discussing Renoir's technique and social import; it's fascinating, especially since an analogous half hour on American TV is unimaginable. Perhaps best of all is Boudu's Paris: An Interactive Map, featuring clips, background information on and sociological context for many of the film's locations, including the Notre Dame Cathedral and the Acad�mie Fran�aise. 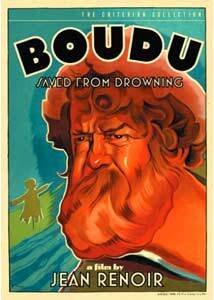 Scabrous social comedy from Jean Renoir, Boudu Saved From Drowning is one of the more droll entries in the director's canon of works. It's at least as interesting sociologically as it is cinematically, though don't let the consideration of 1930s Paris sap the fun out of the adventures of one of the great forces of chaos ever to be put on screen.